This trip didn’t afford enough time to explore textiles in Tokyo, but there were opportunities in Kyoto and in the beautiful town of Takayama where we had some free time. 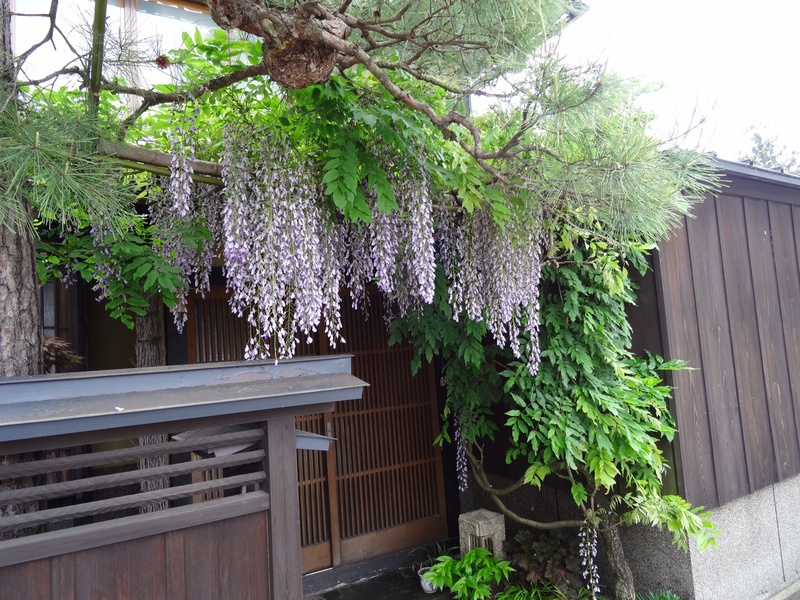 Takayama has some stunning old timbered merchants’ houses and very picturesque streets. 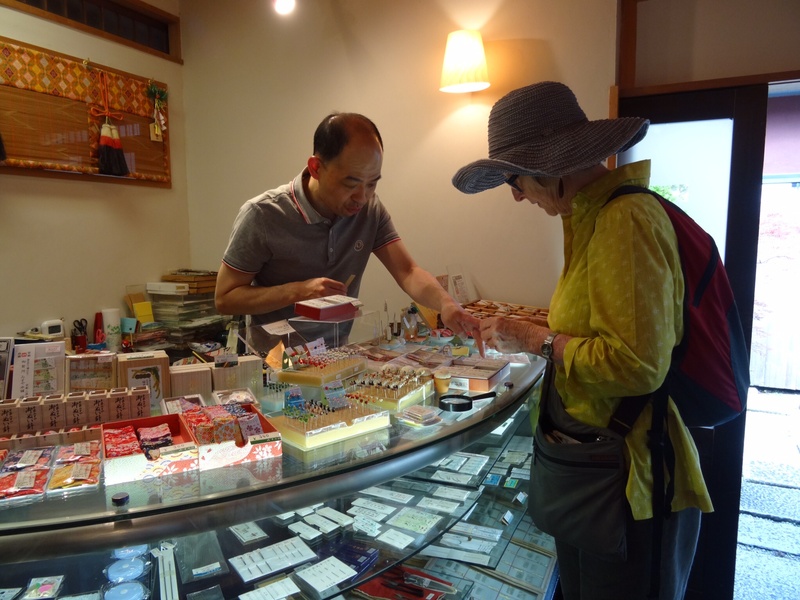 Near the red bridge in Takyama is a shop specialising in sashiko, with fabric, patterns and threads, and also some sashiko clothing and accessories such as purses and wallets. Traditional indigo fabric was available as well as other cottons and silks. I picked up a little bundle of scraps to add to my collection, and a single use sashiko transfer page, just as a memento. 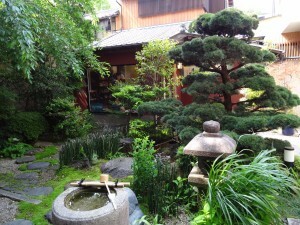 In Kyoto we had more free time and of course more possibilities! 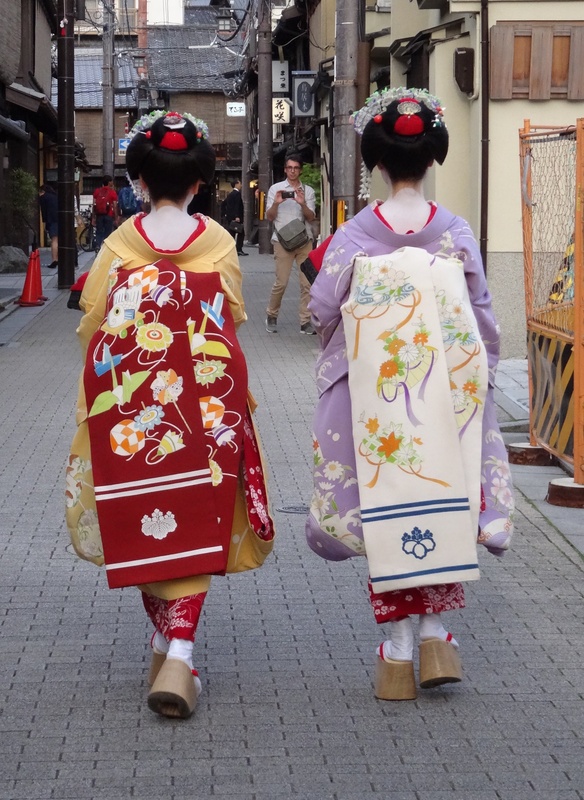 I have to mention the beautiful kimono of the maiko we saw in Gion, who dress in a fabric representing the season, and have hair adornments that change every month! Since it was spring (May) we saw lots of wisteria hair decorations and also iris. But a big feature is the very long obi sash, called a darari obi, which can be 600 centimetres long and has the komon, or insignia, or their boardinghouse on the lower edge. A big feature was a visit to Aizenkobo, and indigo-dyeing workshop that has been in operation for three generations. We were met by the master himself, Kenichi Utsuki, who was keen to explain his processes and his beautiful fabrics and clothing. 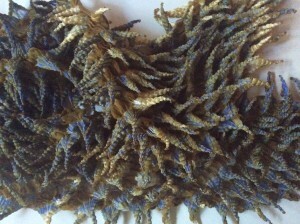 The indigo is first carefully fermented for two weeks to produce a vat of indigo ready for dyeing. An item must be dipped and then sundried between 20 and 50 times to achieve the true Japanese deep indigo colour. 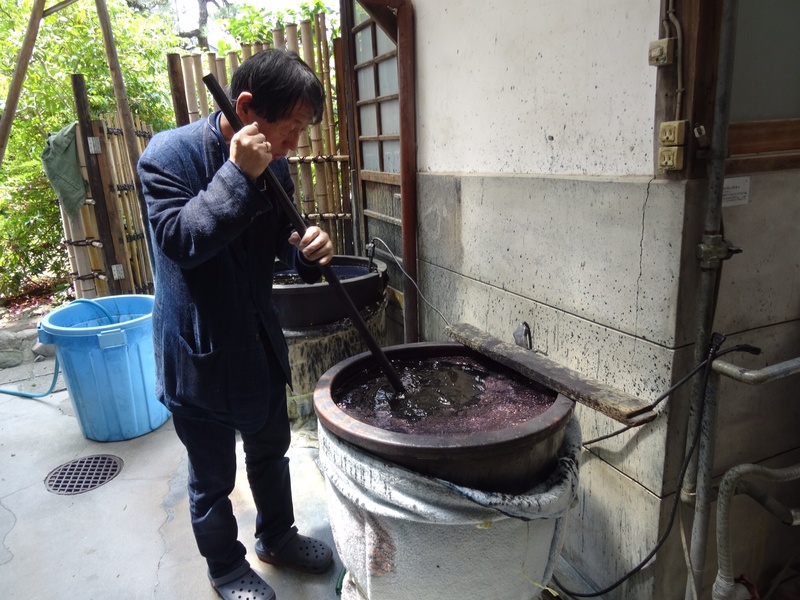 We were shown the vat, stirred vigorously to bring it to life. 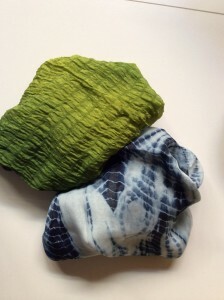 The scarves demonstrate shibori resist technique and variety of colour is also achieved by the use of other additives such as gardenia seed. 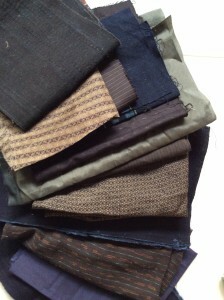 There was plenty of fabric by the metre. Some Japanese style cushions close by caught our eye and – you guessed it – we came away inspired to make them with our newly acquired lengths of fabric. A friend Karen Thiesen suggested a visit to the Misuyabari needle shop, tucked down an entrance off the eastern shopping mall on Sanjo Dori. Misuyabari started supplying needles to the imperial court in 1651, and this tiny, exquisite shop is a gem of master craftsmanship. 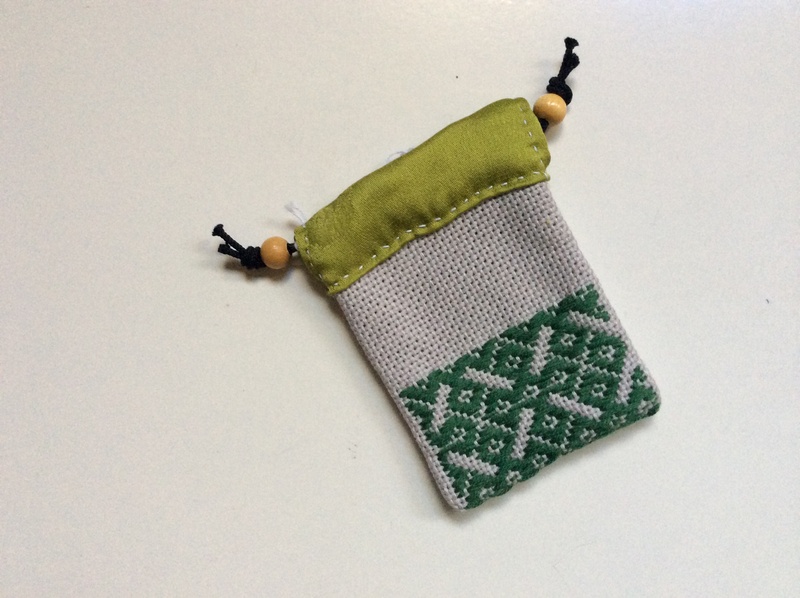 Needles of every kind – yes, my request for embroidery needles was easy to fill, but then I was asked whether I wanted French embroidery needles or Scandinavian embroidery needles? And what size? Once I had chosen a size from the little display card, my needles were handed over…but what about glass head pins? A pin cushion? A travelling sewing kit, in a wooden box, all tools in miniature? So many delights. There was time too to visit the famous Nomura Tailor, for three floors of fabric by the metre and haberdashery – everything here including the beautiful single and double gauze, linen, masses of cottons and the incredible range of seersucker. Not too far away are some tiny but lovely button shops, Idora and Avril, which both had vintage buttons to add to my collection. 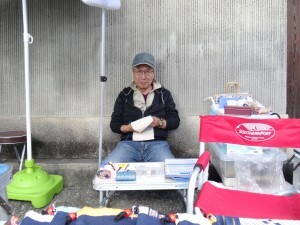 We had timed our trip to coincide the with monthly temple market at Toji, and that did not disappoint. Antiques of every kind, and possibly hundreds of stalls with handmade goods. There were more than enough vintage kimonos and haoris, and also clothing made from them. I loved a stall where a man sat doing kogin, traditional counted thread embroidery. A final hit was Katayama Bunzaboro Shoten, www.bunzaboro.com, a small gallery of some wild and wacky shibori, or tie-dying. Kyo (Kyoto) shibori was once banned because it was so labour intensive that it could take a craftsman more than one year to compete a garment, making it outrageously expensive. Again this workshop has been in existence for several generations, this year celebrating its 100th anniversary, and now specialises in “wearable art”. 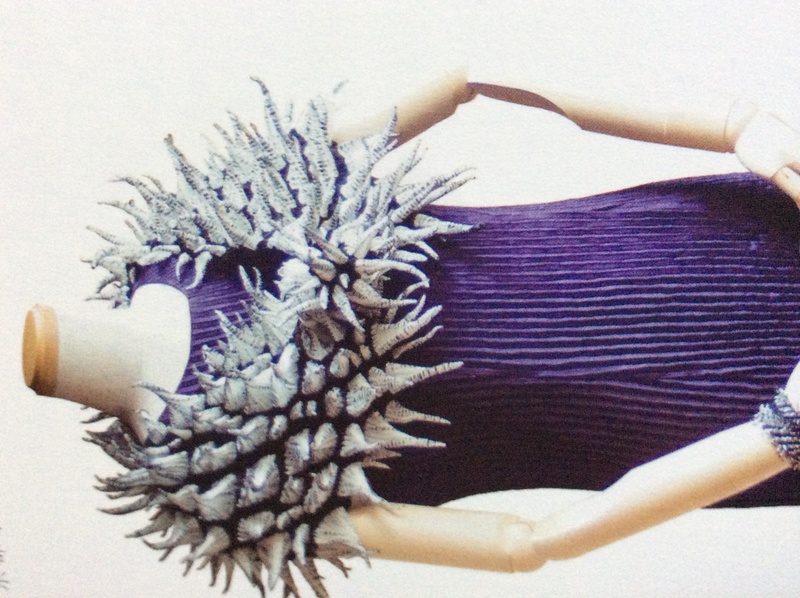 The pieces have a 3D spikey appearance, creating beautiful shapes not just for clothing but for lamps and bags. What a lovely trip for you. I think the tiny bag says it all! When I visited Japan in 1990s I was beguiled by the fabrics and the Kimonos, plus the pottery. My father visited in 1950s and I still have the one my father brought back for me – not sure what happened to the lovely one he brought back for my mother. Thanks for sharing your visit and look forward to seeing the textiles you bought. Just back from a weekend in Lisbon and what an amazing place it is! An intriguing, fascinating, eye opening expose of Japanese textiles and techniques! You make me want to visit and explore as you have! Congratulations!